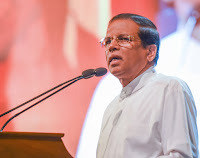 President Maithripala Sirisena says it is necessary to increase the importation of timber to meet the country’s needs in order to achieve the success of the process of increasing forest density of the country while protecting the forest resources. He made these remarks while addressing the 50th Anniversary of the State Timber Corporation held at the BMICH on Thursday (04). the forest density of the country to face the challenges with regard to weather and climate changes. He added that the objective of the government is to increase the forest density from the current 28 percent to 32 percent and he stressed the importance of the contribution of the State Timber Corporation in this regard. President Sirisena explained the importance of investing more for the purpose of increasing the forest density as well as the funds given by the State Timber Corporation to the Treasury and said that in this regard the relevant authorities must cooperate closely with the Department of Forest Conservation. The President pointed out the importance of enhancing the standards and qualities of the State Timber Corporation to face the competition in the field of furniture manufacturing. President Sirisena presented Gold Awards for appreciating the service of the retired officials who completed the thirty years of service in State Timber Cooperation. He also presented scholarships for the children of officers who were selected to the universities. The book “Ada Siya Wasaka Piya Satahan” was offered to President Sirisena and the commemorative stamp which was issued on behalf of completing 50 years for State Timber Cooperation was offered to President by R.M.D.B Meegasmulla, Secretary to the Ministry of posts, Postal Services and Muslim religious Affairs.